Caring.com has helped thousands of families find high-quality senior care. To speak with one of our Family Advisors about memory care options and costs in Casper, call (855) 863-8283. As Wyoming's second-largest city, Casper has a population of 57,800, including 7,600 senior citizens. The community's growing population of older adults had led to an increase in Alzheimer's disease, Huntington's and related dementias. Statewide, nearly 10,000 individuals and 7.2 percent of Medicare fee-for-service recipients have been diagnosed with one more age-related cognitive impairments. Adults who require full-time assistance due to dementia or related conditions are served by one memory care facility located in Casper. 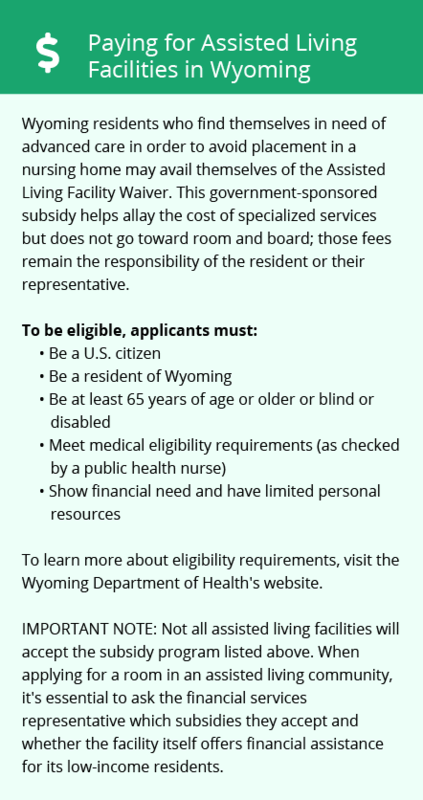 For regulatory purposes, all assisted living facilities that operate secured units or offer dementia-specific services are licensed and inspected by the Wyoming Department of Health. For the most part, the cost of living in Casper is fairly close to the national average for expenses like groceries, utilities and transportation. However, residents pay 36 percent more than the national average for health care, based on the cost of hospital visits, medical appointments and dental checkups. The added expense may be burdensome for residents with chronic conditions, such as dementia. The area's low cost of living is bolstered by the state's favorable income tax policy. Wyoming is one of seven states that doesn't charge personal income tax. Retired residents may keep all of their income, including Social Security, interest, dividends and IRA distributions, which can increase the affordability of memory care and medical services. Casper is home to world-class medical facilities, including those specializing in brain health and dementia care, such as the Wyoming Medical Center, the Summit Medical Center and the VA Casper Community-Based Outpatient Clinic, in the event of medical emergencies or illnesses. One downside of living in Casper is the area's harsh climate. The area receives almost three times more snow than the average U.S. city. Winter temperatures drop into the teens, and summer temperatures reach the upper 80s. Family members who are concerned about severe weather may wish to inquire about the facility's plans to keep residents comfortable. Memory Care costs in Casper start around $0 per month on average, while the nationwide average cost of memory care is $4,781 per month. It’s important to note that memory care rates in Casper and the surrounding suburbs can vary widely based on factors such as location, the level of care needed, apartment size and the types of amenities offered at each community. Learn more about these programs, plus who’s eligible, on our Memory Care in Wyoming page. For more information about different ways to finance memory care, visit our Memory Care in Wyoming page. Casper and the surrounding area are home to numerous government agencies and non-profit organizations offering help for seniors searching for or currently residing in an assisted living community. These organizations can also provide assistance in a number of other eldercare services such as geriatric care management, elder law advice, estate planning, finding home care and health and wellness programs. To see a list of free memory care resources in Casper, please visit our Assisted Living in Wyoming page. 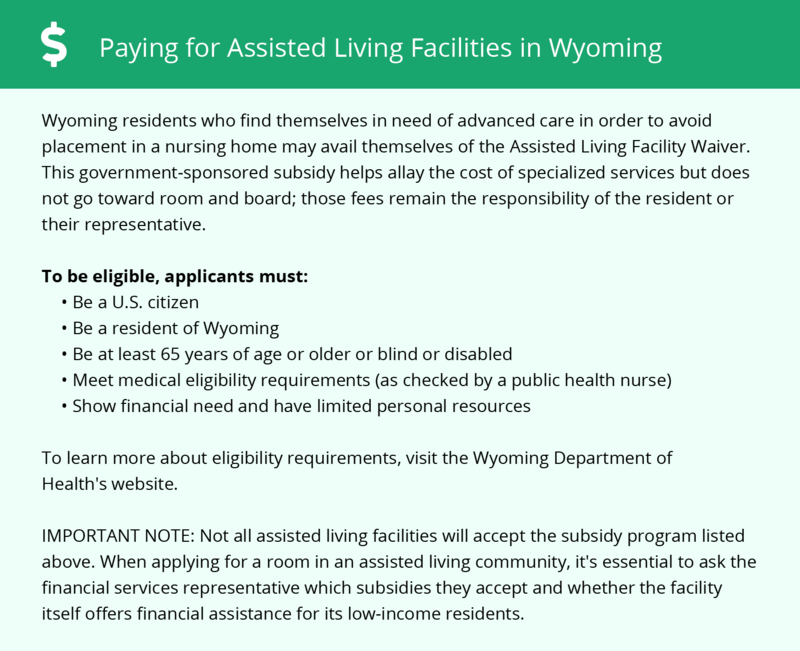 Casper-area assisted living communities must adhere to the comprehensive set of state laws and regulations that all assisted living communities in Wyoming are required to follow. Visit our Memory Care in Wyoming page for more information about these laws.